Everyone loves ravioli. 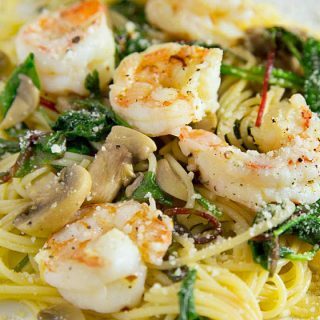 Add a light garlicky shrimp scampi and you've got a delicious combination for your next date night dinner. Why go out to dinner when you can make dishes this delicious in your own home. You may have never thought of topping ravioli with shrimp scampi but I’m here to tell you its a deliciously perfect flavor combination. In my restaurant days finding new ways to use products we already had on hand was a bonus. If you came up with a new way to combine products on hand was a win-win situation. I think I always lean towards using ingredients I enjoyed eating and since I loved ravioli, I used it often in a variety of specials. Ravioli was fairly inexpensive so that meant I could splurge a little on the other ingredients, and shrimp were always a welcome addition to just about any dish, making an inexpensive average meal into an extra special dinner. These days you can find fresh pasta including ravioli at most grocery stores. You’ll usually find them in the dairy section. There about as close to homemade unless you make them yourself. My store carries a nice selection of fresh pasta and although I do prefer the De Cecco brand for most of my pasta needs. But, I always look for fresh ravioli and tortellini in the dairy case. Lisa couldn’t get over how much she enjoyed this dinner ( I couldn’t believe I had never made it for her before). It just goes to show you how easy it is to make Restaurant Style meals in your own home at a fraction of the cost of going out for dinner. Just think, this amazing Ravioli Scampi costs less to make per person than the price of most fast-food value meals and takes minutes to prepare. Staying home for dinner doesn’t have to be boring, and not only do you save money, but you eat better. 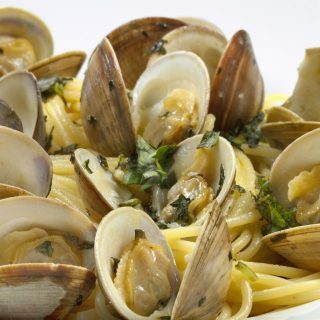 I hope you give this meal a try, just add a loaf of good Italian bread and a salad and you’ll be in heaven. Since you saved so much on dinner why not buy a bottle of wine and rent a movie, now that’s what I call a great home date night! 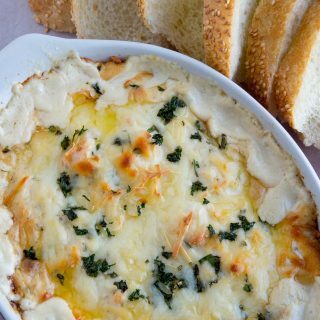 Another great scampi dish you might enjoy is my Shrimp Scampi Dip, it’s perfect for your next get-together. 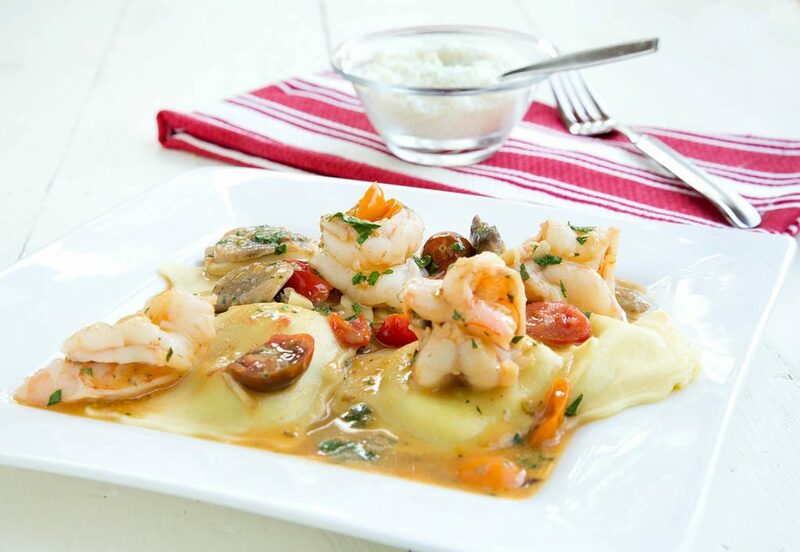 If you’ve tried my Ravioli and Shrimp Scampi recipe or any other recipe on askchefdennis.com please don’t forget to rate the recipe and let me know where you found it in the comments below, I love hearing from you! You can also FOLLOW ME on Instagram @chefdenniseats and @chefdennistravels, Twitter and Facebook. Get water ready for ravioli, mine only took 8 minutes to cook so don't start cooking these until the scampi is almost ready. Over medium high heat place a large sauté pan, when it gets hot carefully add the olive oil and then the chopped garlic. Allow the garlic to sear for about 15 seconds then add in the shrimp and let them cook for 2-3 minutes until they are almost done. Remove the shrimp from the pan and add in the mushrooms, sauté the mushrooms for a few minutes then add in the tomatoes and allow them to cook for about 30 seconds. Add the chicken stock and allow to come back to a low boil, reduce heat . Press the butter into the flour getting as much flour pressed in as you can. (this is called a beurre manie) place this into the hot stock and mix together. This will thicken the stock. Drain the Ravioli and place 4-5 ravioli on each plate then top with shrimp and equal amounts of mushrooms, tomatoes and sauce. 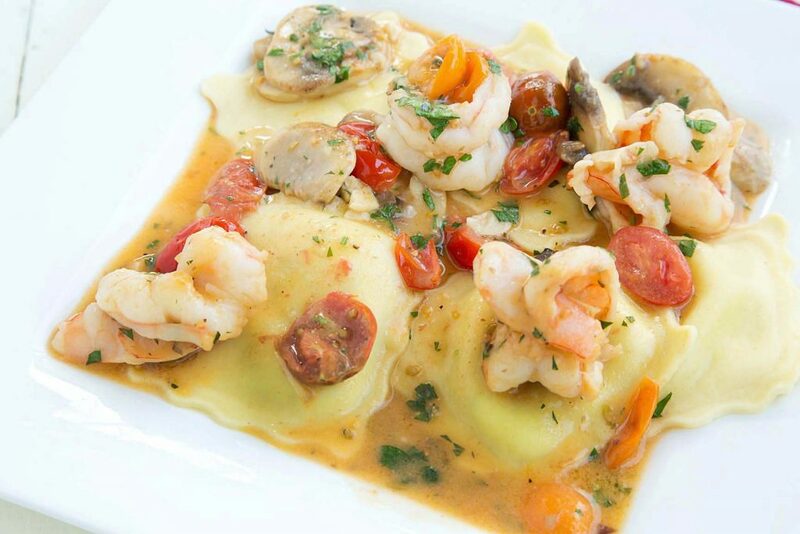 Then sit down to your Restaurant style dinner of Ravioli and Shrimp Scampi! I just made this using left over steamed shrimp and crab meat (were from Maryland so that a normal left over in the fridge in the summer) I just added it at the end to warm them up and tossed in some Feta and it was amazing. My guest loved it too. Thank you so much for the great recipe! Just made it and it is sooooo yummy!!! Forwarded this recipe to all my friends. Will be making this again. Thank you Chef! Thank you! Its one of our favorites too and so easy to make! This looks amazing. Would this hold up on a buffet style dinner? Is there anything I can do in advance? Looks stunning! You never fail to be such an amazing inspiration for me! thank you for such a nice comment Laura, you made my day! I love shrimp scampi!!! Its so funny but my husband’s grandmother is in her 90s and this weekend told the chef in her retirement center that she would like the way he made shrimp scampi, if he left out the garlic. After a long explanation that garlic is a key ingredient in scampi, she was not having it. 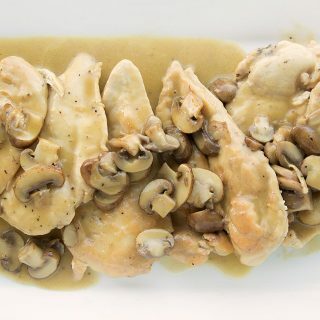 Its so funny that I came across this post today after a weekend spent navigating her food hang-ups;) This version with ravioli looks super delicious. I’m a huge fan of all things cheesy, garlicky, and pasta. There are so many recipes for scampi that the chef should just accommodate your grandmother, especially given her age. My wife is the same way, she likes the taste of garlic but won’t eat the pieces and picks them out. I hope you get to try my Ravioli Scampi its one of our favorites at home. Hi Dennis! I usually read your recipes and drool, but this one stuck with me, especially when the dear ole Acme had jumbo shrimp on sale for $7.99 a pound. This turned out delicious! I’d never mashed four and butter before; I sure will in the future! That was like a thickening miracle. Love your ideas! I’m glad you enjoyed the recipe, it really takes ravioli to another level! I’m giving this one an A+! Can’t wait to try it. Excellent recipe….however, is there a shortcut I could take by just putting a jar of Alfredo sauce? (i.e Trader Joes has a good one)? you could do that, it just wouldn’t be a scampi sauce anymore. Just tried it. Amazing dish Chef! Thank you, it was really a wonderful meal! Thank you Chef, now we know what we ‘re having for lunch today! :):) Also, a big thank you for teaching us beurre manie (at first we thought it was roux) 🙂 ! Thank you, Chef Dennis! I wanted to try something new and I just made this for dinner tonight. My husband loved it! I will be adding this recipe to my favorite recipe’s box. I would like to thank you from my kitchen to your restaurant kitchen for sharing your delicious recipe. You’re very welcome, I’m happy to hear your husband enjoyed it, it was always one of my favorites! Hi Chef Dennis! This looks really delish. It’s my first time checking out your blog, but I am so glad I found it! I have come across tons of food blogs by foodies and home cooks. And many of them are fabulous, but I really wanted to find blogs by professional chefs and read about their experiences in the professional kitchen. There is always so much madness going on and I think chefs always have some fascinating stories to share. In my kitchen, there’s always something whacky going on! That’s the food industry for ya. I look forward to reading more of your blog…and even asking questions in the near future! Thanks Kim, I’m happy you found my blog and do tell my kitchen stories from time to time, and some stories about my training. What a beautiful looks meal!!! Who wouldn’t love this? Oh wow! This looks fantastic chef! Another fantastic meal Dennis. I believe I could just cook your posted recipes and be perfectly happy. Ravioli is one of the pastas I would love to figure out how to make gluten-free. 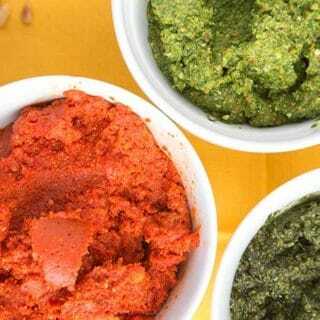 This is a great combination of flavors, and you’ve inspired me to do a little experimentation in the kitchen! In the meantime, I’ll be pouring this over gluten-free penne! I’m drooling over your description! Makes me want to go get some fresh shrimp to make these right now. It’s only breakfast time, but I’m already thinking of dinner. 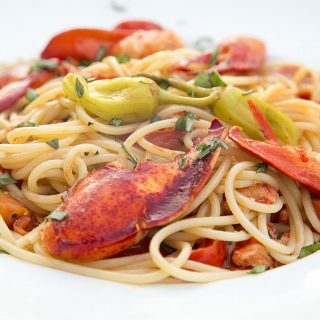 Thanks for sharing this great shrimp scampi recipe, one of my faves! Happy weekend, Chef Dennis!